Are you ready to discover your New Self, the one you will have to be in the New Earth? Are you ready for the ‘Body of Your Dreams’, as a Glorified Being? During the New Earth Body/New Earth Self Episode Quantum Conversations Show of August 7th, 2018, Kartron introduced the Nature of New Earth Self, providing brand new methods for perfecting your Present Self into your Now Self. The very uncomfortable ‘Ascension Symptoms’ many awakening people experience is the Present Earth Body becoming the New Earth Body, as we are going from carbon/physical-based to crystalline/light-based. 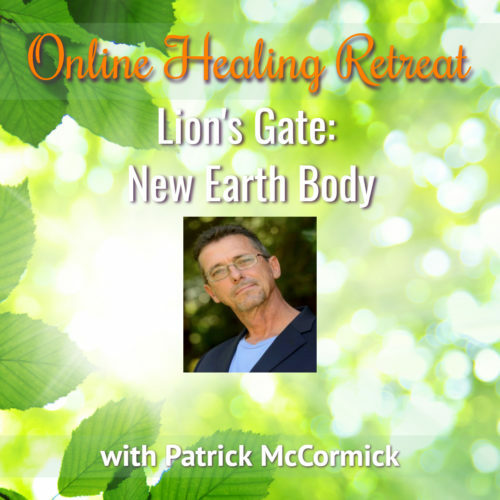 In this Lion’s Gate 8-8-18: New Earth Body/New Earth Self Online Healing Retreat, we delve into the finer Process for Creating your New Earth Self. Beginning on the Lion’s Gate of August 8th, 2018, Known as a Galactic Portal, this Portal is host to the Peak of the 9th Wave Unified Field of Consciousness, which radiates amplified cosmic energy through the Lion’s Gate for easier Awakening. To begin Engineering your New Body for the New Earth beyond mere physical form, we use the Geometry of the Cosmos, establishing our presence and location in space and reality in the Cosmos. The Lion’s Gate of 8-8-18 possesses perfect qualities to begin Creating your New Earth Self, it is a Peak of the Mayan 9th Wave of Unified Consciousness through the 8-8-18 Portal to the Central Sun, allowing your to receive Rays of Source more easily, Using these Celestial Energies as your Foundation, we effectively ‘anchor in your Personal Heaven’. To be in an Ascended World such as New Earth, one must have the Body of Their Dreams. It shall consist of all those qualities, both Spirit and Physical, Universal and Material, as a Body of Light and Form. Assembled from all time, space and experience on your Journey of Many Lives, it is a Self of you as God, as Human, as Celestial, as Universal in Presence. To do so, no longer can we use the limiting references of time and physicality of the human self in a 3rd dimension as the primary reference to gauge our lives and world-views. We have to now Become the Limitless Divine Beings we were always made to be. This Program seeks to ‘Awaken Your Past’, which releases and loosens those charges which occurred in this and other lives, which may be holding you in current ‘ stubborn’ lower patterns. Discharging them frees up the beginning experience in that time which began many issues in our current life. Changing the Source dynamics, makes it easier to alter, because the way things were which created the way things are is a different was, making a different is. By installing a Pillar of Light into the past as a geometric point in that time, we can now access, shift and clear our personal histories that are fulfilled. The Present You Self (that of the intellectual identity) is freed up from the restrictions of limiting perceptions we may have integrated along the way. This present freeing ‘clears the runway’ where your New Earth Self will Land into perceivable existence. The Past being cleared, makes the present cause which came from that effect of the past foundation experience moment of our lives malleable, and more easy to clear. By installing a Pillar of Light into the present geometric point in this time, we access and recreate a new present moment. The ‘future that was to be’, based on what was and is, is what we were going to experience, had that which was and is remained the same. By Opening the New Future Self timeline, we access those moments formerly defined by previous predestination. Now we have a New Future in which to activate that which we choose to become, rather than what we were going to have to become, now based on our current new past and present possibility through conscious consensual choices. These ‘new choices’ of what shall be can now be more in alignment with our True Self, the one we were meant to become, rather than what we had to be and were becoming from. By integrating a New Past Self and New Future Self into a New Present Self re-references our ‘selves’ by our True Natures, rather than use linear time in a mortal 3D realm as our primary reference. This self-defining New Self disconnects from linear time which bound us, making previously inaccessible higher dimensions more available. When properly conducted, a New Now Self, beyond time and dimension emerges, making you available to design your New Earth Self. By installing a Pillar of Light into the future geometric point in that time, we can access and recreate a new future possibility.